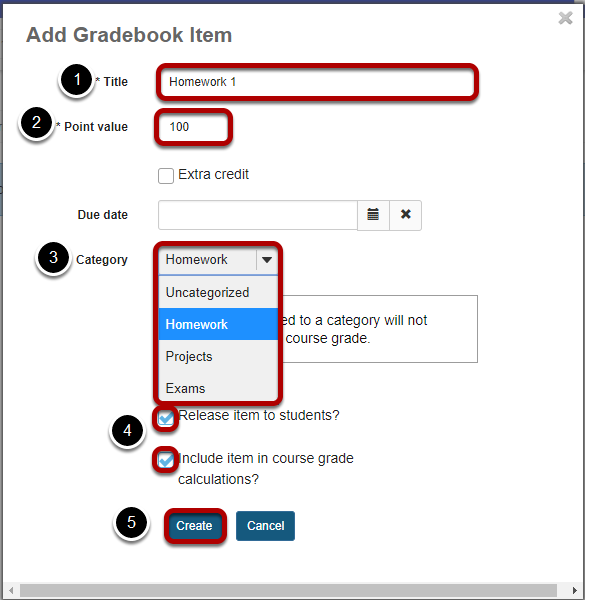 Sakai Guides and DocumentationFaculty Guide Gradebook BasicsHow do I set up a Gradebook with categories for organization and/or dropping grades? 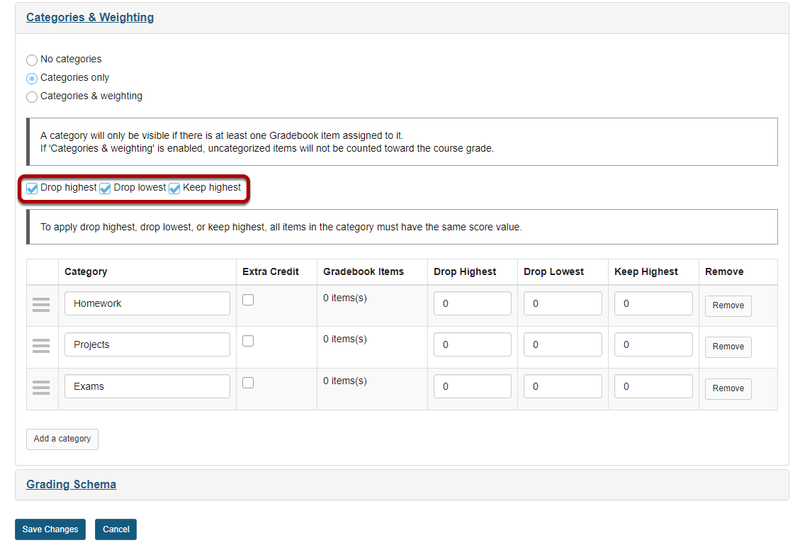 In this scenario, you are setting up a gradebook with categories but no weighting. It provides a straightforward calculation of total points earned in the course. However, the addition of categories allows you to use the Group by Category option to organize the visual layout of your gradebook items. 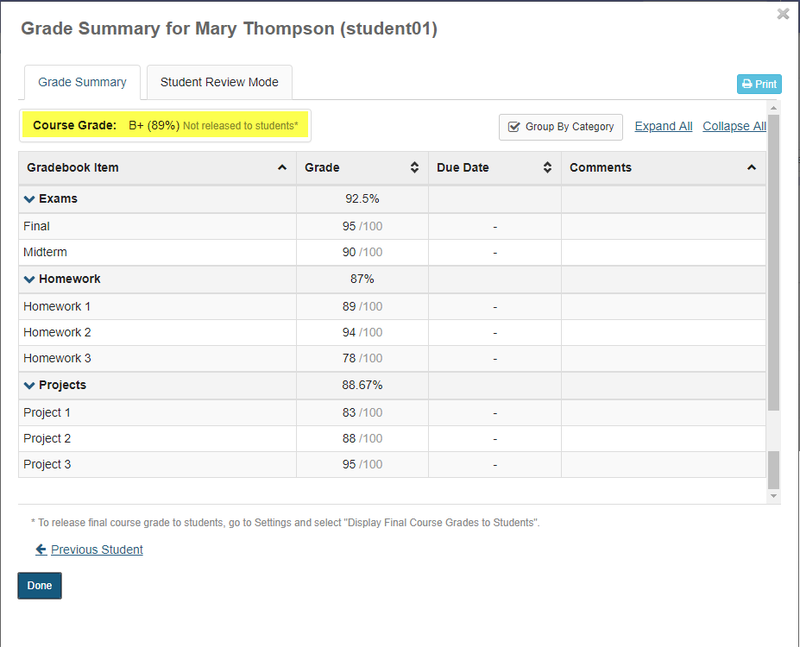 In addition, you have the option to drop grades within categories if desired. Select the Categories only radio button. Zoom: Select the Categories only radio button. Additional options will display once you select categories only. For this example, enter each category as follows: Homework, Projects, Exams. Zoom: (Optional) Enable drop highest, drop lowest, and/or keep highest. If you would like to be able to drop or keep a subset of scores within categories, check the box next to Drop highest, Drop lowest, and/or Keep highest. Note: In order to drop items within a category, all items in that category must be worth the same point value. Indicate the number of items to be dropped or kept within each category. Zoom: Indicate the number of items to be dropped or kept within each category. Add the following gradebook items for this example: Homework 1, Homework 2, Homework 3, Project 1, Project 2, Project 3, Midterm, and Final. The title for the first item is shown in the image above. Assign 100 points for every item. 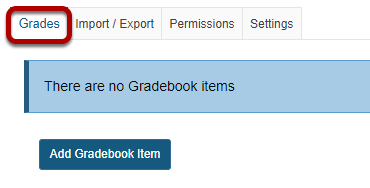 Make sure to assign each gradebook item to the appropriate category. All Homework items should be assigned to the Homework category, Project items should be assigned to the Projects category, the Midterm and the Final to the Exam category. 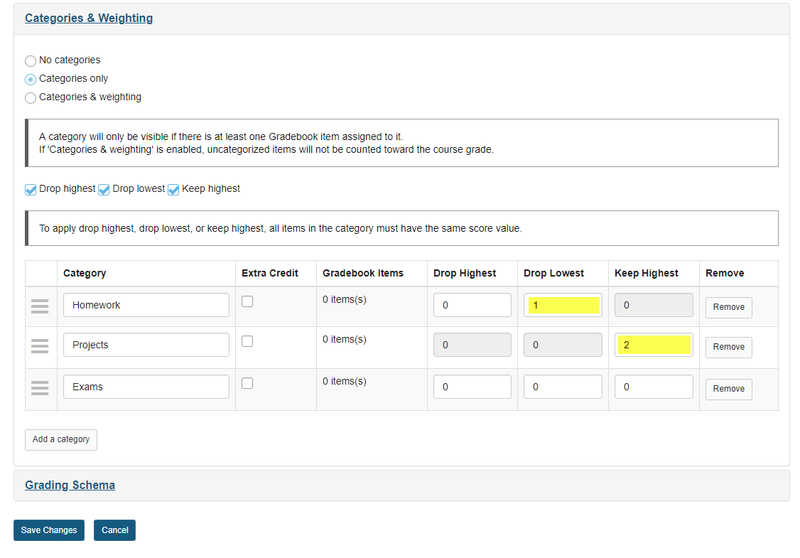 The Gradebook will automatically add up all of the scores and divide by the total points possible. If no grades are dropped, then the grade calculation is (89+94+78+83+88+95+90+95)/800 points. The student's overall grade average = 89%. If the lowest 1 score is dropped in the Homework category, and the highest two scores are kept in the Projects category, the grade calculation would be (89+94+88+95+90+95)/600 points. The student's overall grade average = 91.83%. The categories and dropped scores within categories are set up correctly. Each gradebook item is worth 100 points. Each gradebook item is assigned to the correct category. 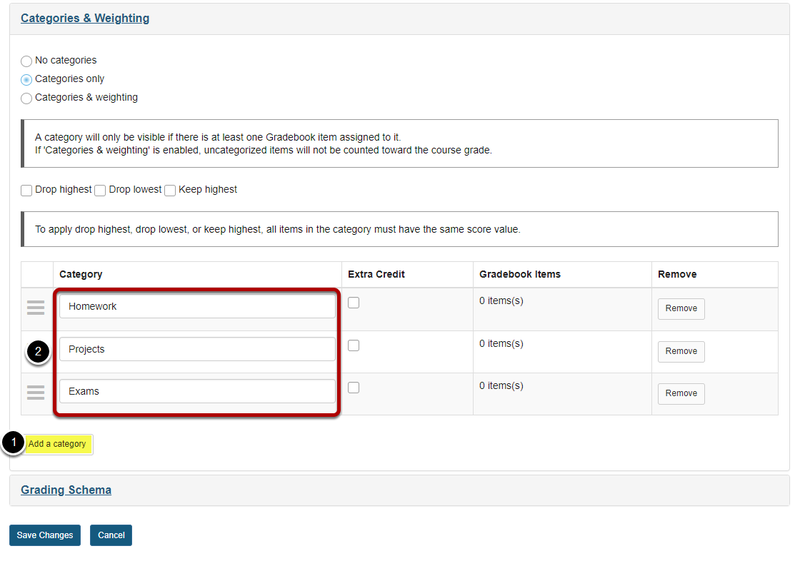 Each gradebook item is released to students and included in gradebook calculations (two checkboxes). 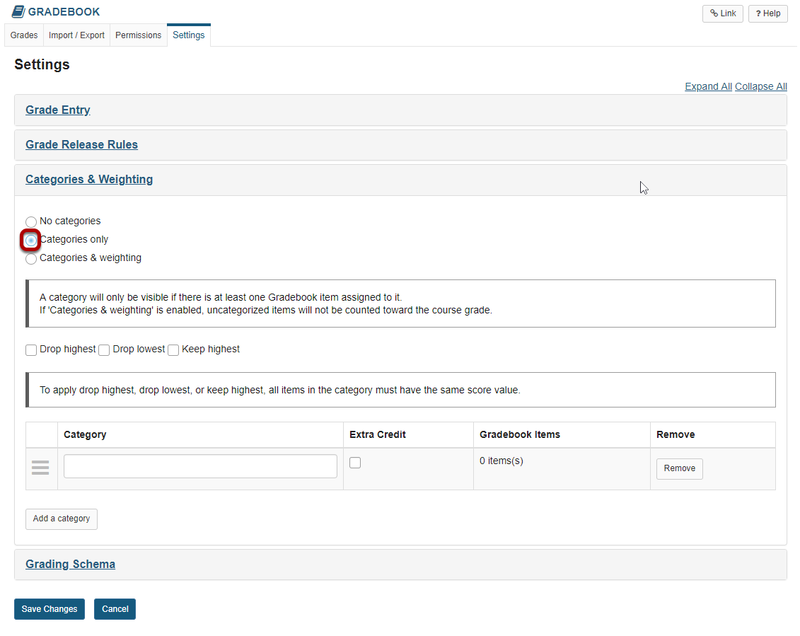 Prev: How does extra credit work in Gradebook? 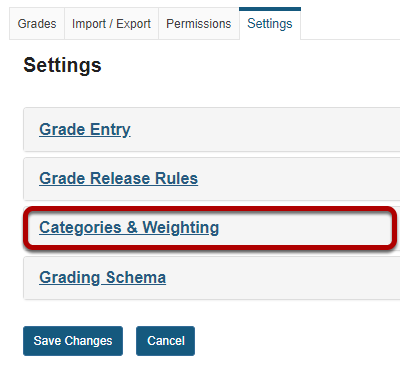 Next: How do I set up a Gradebook with categories and weighting?